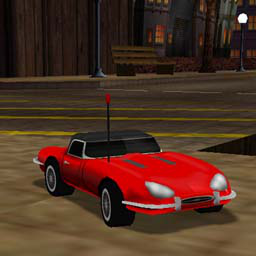 A car based on Jaguar XKE. It was a British sport car manufactured by 'Jaguar Cars Ltd' between 1961 and 1975. I made this car for nostalgic reasons. Have you ever heard about a game called Interstate '76? Well, its expansion pack (the Nitro Pack) contains this car, and it was one of my favorites in the game. The mesh and paintjob style were borrowed from it, as well as real Jaguars around.